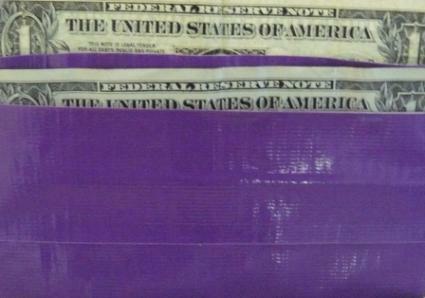 Duct tape is a versatile craft medium that can be used to make everything from purses to prom dresses. 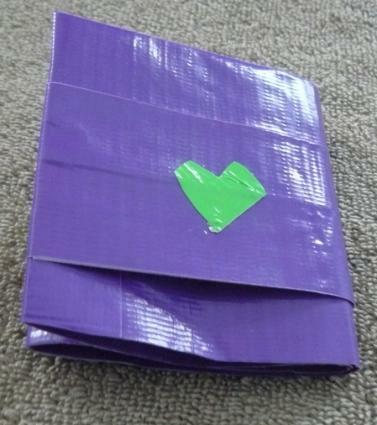 While you can purchase duct tape wallets in a myriad of shapes and colors, you can also fashion your own in a few cuts and folds. This is a fun craft that requires little more than some duct tape and a bit of time. This wallet is both fashionable and practical. Once your friends see it they will want one of their own. Cut two pieces of duct tape measuring about 7 inches each. Lay them sticky side up, parallel to each other. Overlap the two pieces by 1/2 inch and stick them together. Repeat the process to connect two more pieces. Lay one of the connected pieces on top of the other, with the sticky sides facing each other. You should now have a solid piece of duct tape with no sticky sides. Repeat these steps to make another solid piece. Cut another piece of duct tape measuring 7 inches long. Place the two solid pieces on top of each other so they line up perfectly. Stick on the new piece of duct tape overlapping the bottom of the top panel. Flip all the pieces over and stick the overlapping piece to the underside. This connects the bottom of the wallet. Cut two pieces of duct tape each measuring about 4 inches long. Use these pieces the same way you did in the previous step to close the sides of the wallet. Trim off any excess tape. Your wallet is now complete. Make the basic wallet and set it on a working space, opened up. Cut a piece of duct tape measuring 7 inches long. Place it sticky side up on top of the open wallet with the top of it aligned with the top of the wallet. 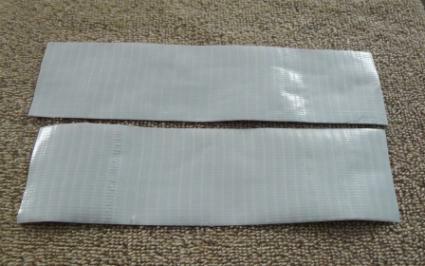 Cut two pieces of tape, each measuring 8 inches long. Place one piece sticky side down, directly on top of the piece you placed in step 2. 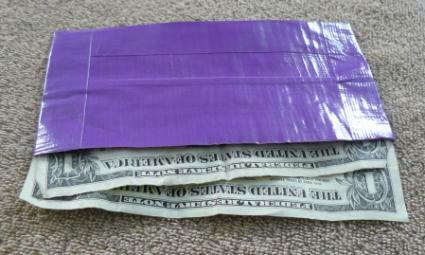 Fold the overlap on both sides over the wallet to close the sides. Lay the second 8- inch piece slightly overlapping the bottom of the pocket. Fold it over the sides to secure the bottom of the pocket. Add additional pockets as desired, staggered below the first. 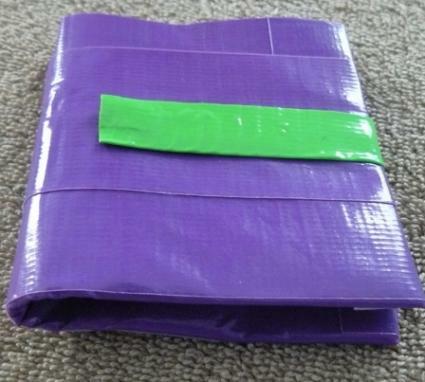 Variation: Make the pocket 2 pieces of duct tape deep to fit larger items. A Velcro strap keeps your wallet closed and adds a finishing touch. Use a contrasting color of duct tape for added flair. Cut a piece of duct tape measuring 6 inches long. Fold the piece in half to make a strap. 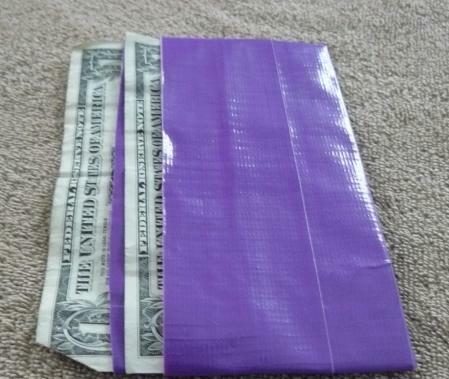 Place one side of the sticky Velcro in the center of the wallet. Stick the other side of the Velcro to one end of the strap. Connect the two pieces of Velcro. Fold the strap over the open side of the wallet. and flip the wallet over. Use a 3-inch piece of tape to attach the strap in place on the back of the wallet. Use a single cut-out for a simple embellishment or use your creativity to make a more complicated design on your wallet using this technique. 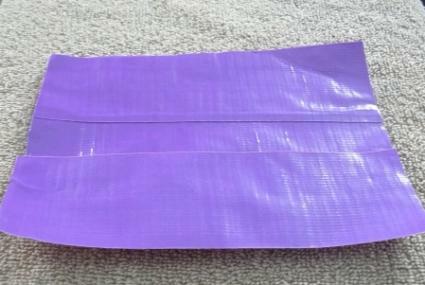 Use a pen or marker to draw a design on a piece of duct tape while it is on the roll. Unroll the piece and cut the design out. Stick your design to your wallet. Original and unique, duct tape wallets are truly a fashion statement. You can make one to go with every outfit. These make fun gifts and once you get good at making them, they can be put together and customized in a snap. 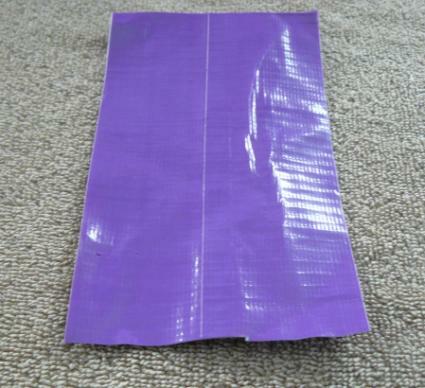 Be sure to keep your eye out for new and exciting colors and patterns of duct tape to create even more variations.